To see more of Earth, click here. This entry was posted on 05/08/2016 at 09:25 and is filed under Photos. You can follow any responses to this entry through the RSS 2.0 feed. You can leave a response, or trackback from your own site. 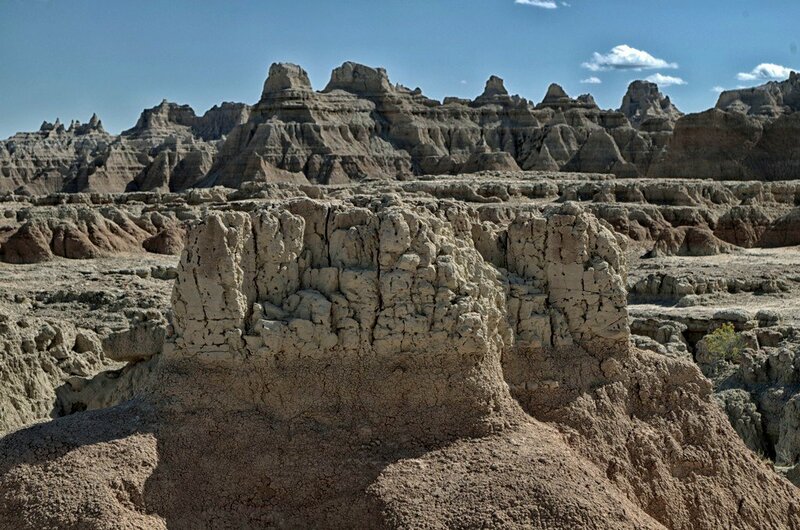 I saw this was in South Dakota – the Badlands? Or elsewhere? Yes, the Badlands. I don’t remember the name of the area, but it’s probably the second parking lot from the east entrance – then about a 1/4 to 1/2 mile walk to get behind a large hill to be down among these smaller rock formations and pretty much surrounded by the larger formations. A very unique place and experience. The Badlands certainly are that! I spent plenty of time there on family vacations as a kid, and got back out there on our honeymoon. It’s beautiful, but not in what I would call a traditional way. Thanks. A very interesting place. Where is the “love” button, dude? The photo is cool, and your words fit perfectly! Very cool post, perhaps my favorite of yours. Thanks. Much appreciated. That one used up my reserves of thought for the year. The last time I saw it, the love button was somewhere in the WP Reader? I know…it’s usually one line for you. Yep. An interesting place to visit if you just happen to be driving in South Dakota.